As I believe I have mentioned a time or two (okay, probably like twenty times or two), I absolutely love the combination of peanut butter and chocolate. I am game for trying basically anything that involves these two magical beings. Before Christmas, I was putting together a gift for the White Elephant game we would be playing at work. I ended up doing a Mexican Food Basket – Modelo, Negra Modelo, 2 Corona Beer Glasses, Chips, Salsa and Salsa Verde. In order to get top notch ingredients for this basket, I visited the local Fresh Market. Fresh Market has a number of specialty food items, organic offerings and all around good stuff. They can be quite pricey on some items but it is an easy place to find something new to try time and time again. While I was getting my basket ingredients, we spotted individual Lindt Truffles at the check-out. They were on sale 2 for $1. I believe I tried one of these years ago but am not totally sure. I saw that they had Peanut Butter-Milk Chocolate Truffles so I decided to, of course, try one. Taylor also got some Dark Chocolate truffles which he has had before and loves. 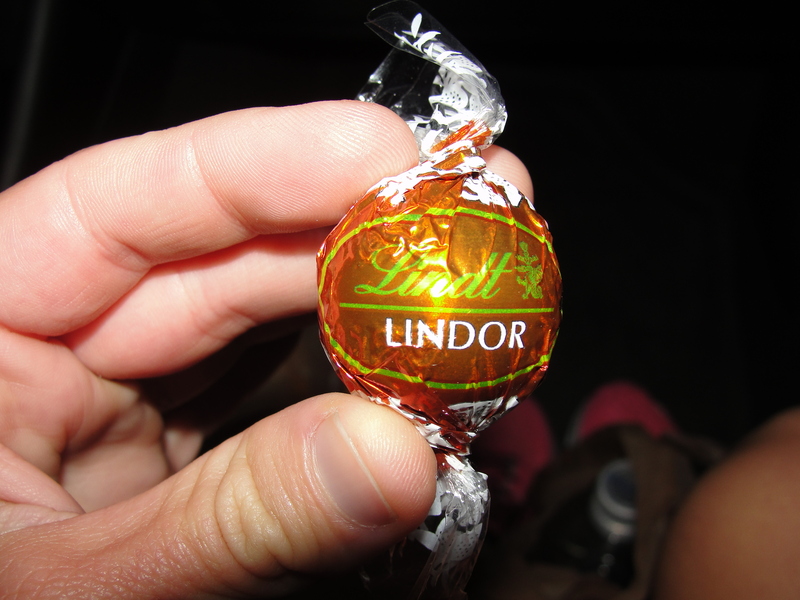 After seeing a million Lindt truffles commercials, I was expecting this to be pretty darn good. We checked out and headed out. After a few brief moments in the car, I decided it was time to whip open this sucker and try it out. On first look, the truffle appeared as if it would be good. The milk chocolate had a nice soft brown color and I could smell hints of cocoa. I was expecting to bite into the truffle and have the peanut butter ‘melt’ into my mouth. When I think of something melting, I think that it should be pretty runny in texture. I bit into the truffle and did not experience any melting peanut butter streaming into my mouth. Instead, I found peanut butter. Just plain, normal consistency peanut butter. As I continued to eat the truffle, the consistency of the peanut butter did not change at all. I was pretty disappointed in the lack of waterfall-like melting peanut butter, cascading into my awaiting mouth. The milk chocolate in this truffle was quality milk chocolate. It seemed to be a good combination of cocoa and cocoa butter and its consistency was quite good. I let the chocolate melt in my mouth for the first bite, and the flavors of the chocolate lasted the entire time. The creaminess of this chocolate really made it good. Not amazing but really good. I also appreciated the fact that it was able to contain the non-melty peanut butter inside. There were no instances of the peanut butter pouring down my hand as I nibbled away at the chocolate outside. 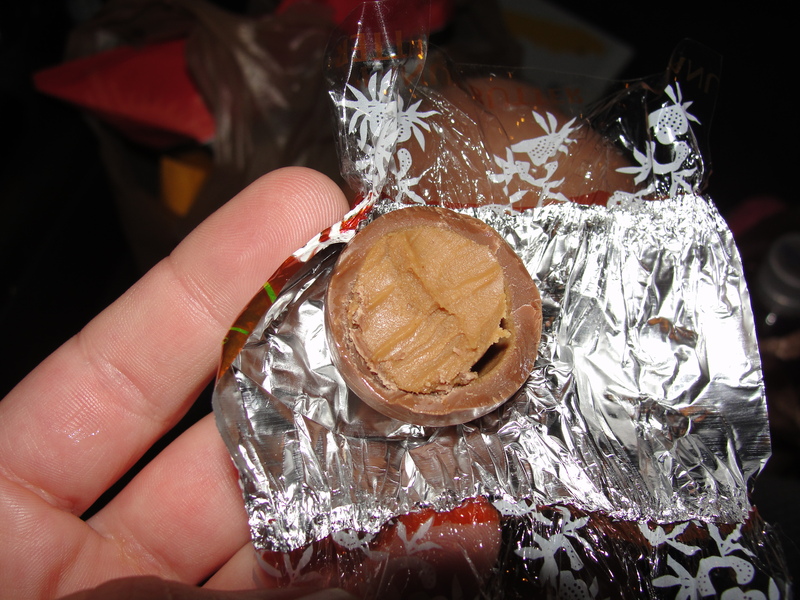 By far, the peanut butter inside was the most disappointing part of this truffle. The peanut butter tasted like bland, boring peanut butter. There was nothing melty about this or nothing that made it really stand out. While it did blend well with the creamy chocolate, that was about all that it did. I simply did not love this peanut butter filling at all and was truly disappointed. While I do enjoy natural peanut butter, with its subtle flavors of peanuts, I can’t even say that this was close to that. I appreciate simple peanut butter but c’mon, if I’m not getting a melty waterfall, I at least need some flavor. 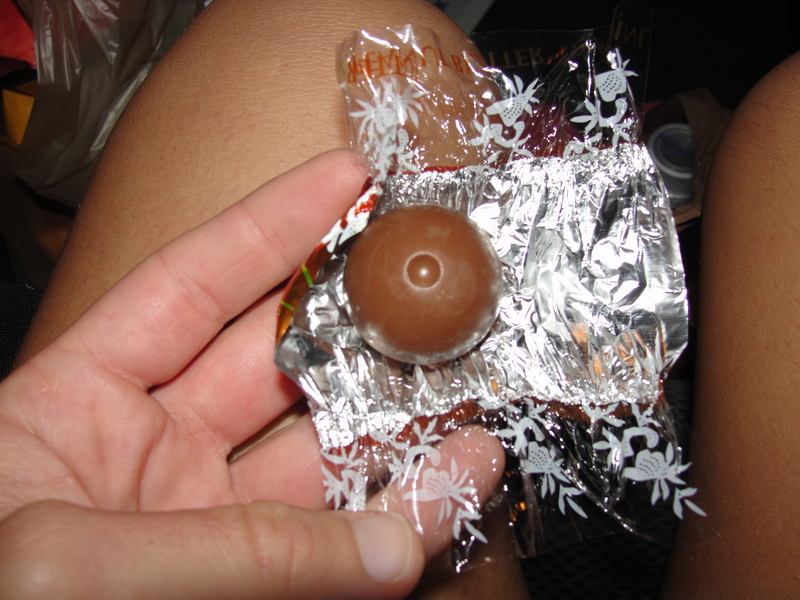 Overall, I was really quite upset with these Lindt Peanut Butter-Milk Chocolate Truffles. I am really glad that I only bought singles of these rather than an entire bag full. Since I tried this truffle, I have tried the White Chocolate Lindt Truffles and it was like night and day. The White Chocolate Truffles truly melted in my mouth. Even though I was quite disappointed in the Lindt Peanut Butter-Milk Chocolate Truffles, the White Chocolate Truffles have made up for the beef I had with Lindt. To all my fellow buckeye-loving readers…avoid these Peanut Butter-Milk Chocolate Truffles at all costs. And buyers beware, there will be no melting peanut butter waterfall coming from these truffles.